President Donald Trump replaced his head of the State Department with the current director of the CIA on March 13. Rex Tillerson has been the Secretary of State since Trump took office. Trump appointed CIA Director Mike Pompeo as the new Secretary of State, lauding his accomplishments at the agency. “I am proud to nominate the Director of the Central Intelligence Agency, Mike Pompeo, to be our new Secretary of State,” Trump said in a statement. “As Director of the CIA, Mike has earned the praise of members in both parties by strengthening our intelligence gathering, modernizing our defensive and offensive capabilities, and building close ties with our friends and allies in the international intelligence community,” Trump added. The president promoted the CIA’s current Deputy Director, Gina Haspel, to the top role at the agency. Once confirmed, Haspel would become the first woman to serve as the head of the CIA—”a historic milestone,” Trump said. “Mike and Gina have worked together for more than a year, and have developed a great mutual respect,” Trump said. 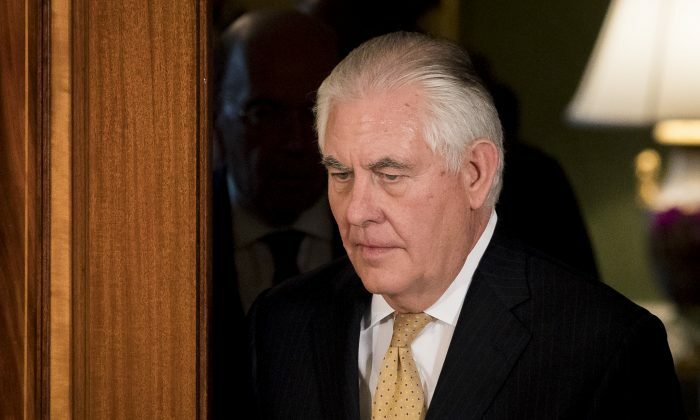 Over the weekend, Rex Tillerson fell ill during an Africa trip and canceled some appearances. Haspel said she was humbled by the opportunity to head the agency she has served for over 30 years. “If confirmed, I look forward to providing President Trump the outstanding intelligence support he has grown to expect during his first year in office,” Haspel said.